Life is filled with stressors, from work, school, and everyday life in general. It’s easy to forget to take the time to take care of ourselves but it’s important to take the time to de-stress. Doing so helps your mind and body relax and maintain a healthy overall well-being. While those enviable resort spa vacations are dreamy and relaxing, they’re also pretty pricey and not something we can do as often as we’d like. Instead, you can bring that resort spa feel to your own home. Here are some tips to create a spa experience that doesn’t require an appointment. Start your spa experience with the right atmosphere: turn down the lights, burn a few small candles and turn on some chill music. Aromatherapy is also a great way to get your body to loosen up. There are a lot of options to bring in some relaxing scents into your bathroom, through scented candles, aromatherapy diffusers or adding a few drops of essential oils right into your tub or shower. Scents like lavender, frankincense, orange, or vanilla can help reduce stress. Be sure to remove or reduce any potential distractions or loud noises that can keep you from fully unwinding. A long, hot bath or shower can be a decent stand-in for a massage by loosening your muscles. Another bonus is that the steam from a shower can help clear sinuses as well. Don’t forget to treat yourself to some classic spa treatments while soaking in your tub or shower. You can exfoliate your body with a sugary scrub (store bought or homemade! ), give your hair a rich deep condition, and a facial. Facial masks are a convenient and inexpensive way to refresh your skin. Keep your comfy bathrobe or pajamas nearby to slip into following your bath! A spa day isn’t complete without some downtime for resting. Following your body treatment, grab a book or some music (or even a glass of wine) and find a cozy and quiet place in your home to settle in for some quiet time. Turn off your phone and avoid checking your notifications; everything can wait. You can read, meditate, daydream, nap, or even catch up on your Netflix queue during this quiet time. How you choose to relax and recharge is up to you. We all deserve to treat ourselves every now and then. 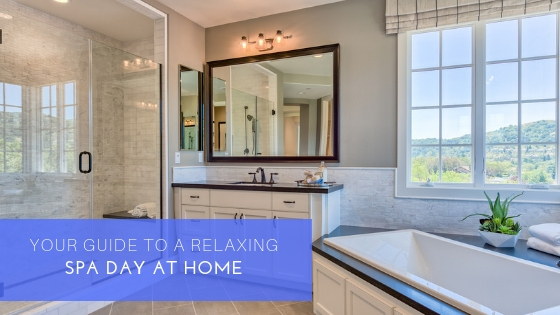 These simple tips will allow you to create a dream spa experience from the comfort and privacy of your own home.